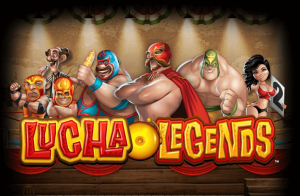 Lucha Legends is a colorful and fun video slot released by Microgaming in October 2018. As you probably guessed it by the title, it’s themed around Mexican wrestling. What’s more is that it has beautiful animations and an upbeat soundtrack! Wait until you hear the mariachi music in the background, you won’t be able to stop yourself from moving to the beat! With the release of Lucha Legends, it seems that Microgaming decided to treat everyone for Halloween. Indeed, this game not only has two different game modes. It also has bonus features that everyone loves and understand. How does Free Spins, Random, Stacked and Wild Multiplier sounds? Plus, this slot is of low to medium volatility which means that cautious players will love the frequent wins this game offers. And experience players will adore the fact that this is a great slot to wager a casino bonus on! Bonuses & features: 2 Different game mode, Stacked Wilds, Random Wilds, Wild Multipliers, and Free Spins. Highest-paying symbol: 5 Luchador symbols on an active paylines reward you with 6x your stake. Suitable for: Cautious players, Everyday pleasure seekers and High Rollers. First, let’s say a few words about the different game modes. In fact, after loading Lucha Legends, you’ll notice the Red 2x button on the right-hand side of your screen. Push the button upwards, and you’ll activate the Power up mode which means, you’ll win more with the randomly triggered feature since it awards bigger multipliers. But, of course, activating this feature will cost you a bit more (2 times more in fact). If you’re an avid casino player, you already know that whenever a game has different characters, there’s a good chance that each character will have unique powers. Well, it’s exactly the case for this video slot. In fact, randomly, El Diablo will jump on the reels in the base game and in the Free Spins bonus to give you Extra Wilds. What’s more is that if you play in Power up mode, he’ll also reward you with Multipliers up to 5x. Martio, the green wrestler, on the other hand always reward you with Wild Multipliers when he humps on the reels in standard mode. And in Power-up mode he’ll give you Stacked Wilds. Sal & Pepe, the wrestling brother, will also randomly appear on the reels to give you Extra Wilds. But this time they’ll be on the inner reels. Lastly, there’s Burro, who also rewards players with Wild Multipliers. Honestly, Lucha Legends has a lot to offer. And yet we’ve not even discussed the Free Spins bonus you’ll trigger with the help of 3 Scatter symbols! All and all, this video slot is perfect for all levels for players who are looking for a slot with a humoristic touch. Try it at any of our listed casinos and have fun!